Why Is One Room Getting Colder, But the Other Room Is Staying Hot? You are here: Home » » For the Homeowner » Why Is One Room Getting Colder, But the Other Room Is Staying Hot? As people are becoming more concerned with energy efficiency, they are paying attention to how the air conditioning is behaving in each room. So why is that room seem to be getting the cool air is a question I am hearing more often. I am sort of squat walking and crawling through an attic where my way is blocked by a warren of air conditioning ducts. This other section of attic cannot be reasonably reached, so I snuggle close with my flashlight, and I try to peer into this cave. In the mean time, I am in a bed of fiber glass insulation, so I am not feeling too great. This mass of air ducts through a small gap is not to uncommon. Yet the framing in certain attics can present a daunting task. Attics framed with roof trusses seem to have this problem more often, but I do see it in other attic, placement of the air conditioning system leads for a tight fit for the ducts needed. This problem with the ducts has caused a few rooms to stay warmer when the cooling is going. Builders plan out the air duct size to determine how much air is required going into the system, while also planning how much air should go to each individual room. It used to be that the closer a room was to the air conditioning equipment the cooler it would be. At one point, they realized that the Master bedroom had to be at a comfortable temperature, but maybe the children’s rooms was not as important. We are moving into an age where we want comfort in various rooms, so our systems are being designed to meet these needs. At first, this adjustment of the amount of conditioned air was achieved by duct size. Larger ducts delivered more air to the room that was meant to be at the better temperature. Smaller ducts went to less important rooms. We developed what you can think of as valves, but are more properly thought of as dampers. Metal plates in the line could adjust the amount of air going to a room. These dampers were set by a technician, who studied the air flow through the rooms of the house to find an optimal setting. These plates in more modern ducts are controlled by motors and computers. This allows the air to be constantly readjusted to meet the cooling and heating that is wanted by the family. All of this is leading to the ability of having each room set to its own temperature that is best for the comfort of the occupants. Stepping back to my problem in the attic, we can look at the photograph of the air duct. This is a return duct, which brings air from the house back to the cooling and heating equipment. The size of this duct is determined by the requirements of the system. Here you can see that the duct is crimped by the stud. If you think of your garden hose, you will obtain a more visual way of understanding what is happening. You are holding the hose, and it has been turned on to its full amount. As you bend the hose, restricting the flow of water, you will notice the water traveling farther, faster. The pressure has increased, but the amount of water has decreased. As we continue to bend the hose over, we will continue to see this effect, until the hose is fully bent back, shutting the water off at the hose end. This is what is happening to the air in the duct. We now have three reasons why our conditioned air may not be the same from room to room: the duct size could be different, causing more conditioned air in one room; we have an older system with all the ducts the same size, so the air travels to the closer rooms first with rooms further away receiving less; and the ducts have been crimped. To resolve the first two situations, we may want to have dampers installed to direct the air evenly around the house. For the last issue, we have to straighten out our ducts. What if this is not happening in my home? For most of us, our ducts are traveling through our attics, which are exposed to the exterior temperatures. When you have a day that is around 82F, the attic could be 120F. This duct could be effected by those temperatures. If the duct is not sealed from this environment, we feel the effects. The cool air is being mixed with hot air from the attic (the reverse happening during colder times of the year). There can be rips in the duct anywhere along its length. I find the most happen near the part of the attic where storage occurs. I also find that where the duct may join with another piece can be a problematic spot. This means the connections at the plenum (the big boxes at either end of your equipment) or at where it attaches to the vent for the room. The solution here is to check the line. I find it easier to find leaks when checking the cooling while the attic is hot (at least this is for Houston, where our winters are mild). Another possibility is the amount of insulation around the duct. There is not really any method of determining iinsulation covering, unless you are taking the duct apart. Most older homes with the original duct work will not have much in the way of insulation, unless a homeowner has added a new covering. Again, if your ducts were running through conditioned space, you will not have to be too concerned with insulation. How much insulation should you have? The more insulation that you can fit over the duct would be better, but we do get to the point where we just cannot place a massive amount of insulation around the duct. Typical R-factors for ducts measure around an R-6 to an R-8. 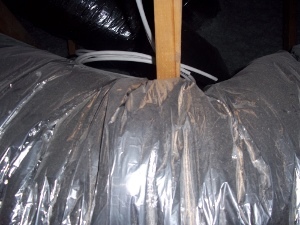 If the insulation around your old duct is flat and thin, then using a new insulation wrap will help. How we heat and cool our homes is changing. The real revolution may be the new building that are so tight that you could get away with little in the way of heating or cooling. However, equipment is improving as well as changing. There are ducts made of a linen material that can be run inside the house. When dirty, you bring them to the dry cleaners. I am more interested to see how we develop ducts for our existing homes. Maintaining and improving our current housing stock is what will be needed for most homeowners. This entry was posted on Tuesday, April 5th, 2011 at 2:30 pm	and is filed under For the Homeowner. You can follow any responses to this entry through the RSS 2.0 feed.